Tradition, intercultural approach, improvisation: Roots Revival Romania, an event where the peasant music from Maramureș country, Romania and the locals way of life become inspiration sources for a group of musicians from different countries. 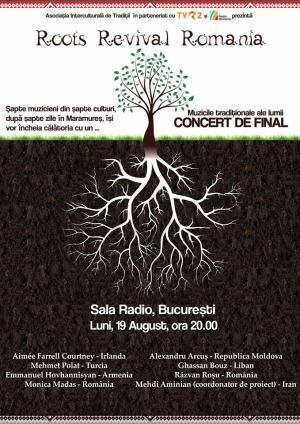 "Roots Revival Romania - Final Concert" Concert in Bucharest. You can get here description, reviews, address, time and details of "Roots Revival Romania - Final Concert" Concert in Bucharest. Visit Bucharest Tips for more Concert events in Bucharest!